The 10 Best Corn Mazes in New Mexico! The corn is as high as an elephant’s eye in corn mazes across New Mexico in anticipation of the fall season. They come in all shapes and designs, but there’s one constant—finding the way out. 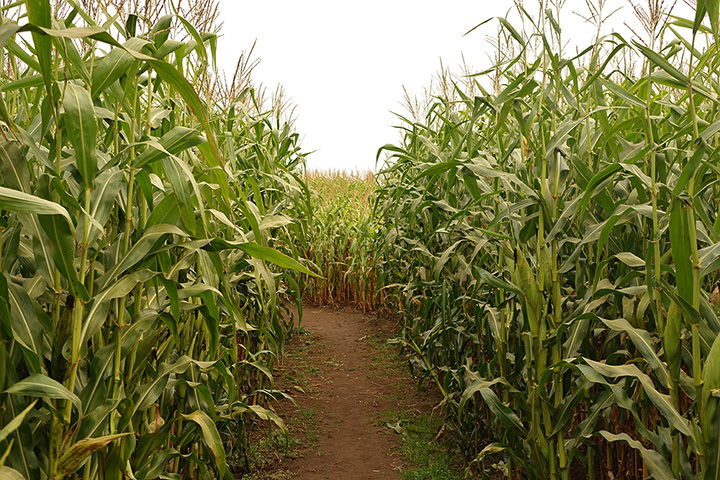 Here are 10 corn mazes that make the whole adventure a bushel of fun. Get lost in the state’s original corn maze, a giant five-acre puzzle of twisting pathways, dead ends and wrong way turns that’s an exhilarating afternoon of adventure. This is an old-fashioned good time. If you manage to get out, pick up a pumpkin to take home. La Union Maze puts together some of the most intricately-designed mazes around. Past designs include “Lost in Space,” a Mayan calendar-themed maze, among other fascinating designs. Other activities include wagon rides to the pumpkin patch (where you can pick your own! ), pig races, a cow train ride, and more. Every year the maze makers here create a new and perilous adventure on the 16-acre corn field to test those gutsy enough to enter. This is a great place for all ages. In addition to the maze, you can take a hayride, race around the pedal cart track, get a good bounce on the jumping pillows, count corn in the corn box and pick up that perfect harvest season pumpkin. Open late September through Halloween. Admission fee includes entrance to the park and most activities, plus access to the corn maze and a hayride to the pumpkin patch. In addition to a corn field maze, hay bales, both rectangular and giant rounds, are used to create unique and inventive labyrinths to wind through—sometimes it’s a tangle of only right turns, too. For the littlest ones, there’s a sea of pumpkins maze that they can wander through until they’re tuckered out. A hayride and a pumpkin mountain, brings everyone up-close-and-personal to the art of farming. Open weekends in October. Admission fee except for those three and under who are free. The folks put the corn in the ground a while back, planning early for the six-foot-tall walls the stalks will make. With 2.2 miles of trail, this is not just an exciting activity it counts as exercise! A little something for everyone makes this a fun family day—pumpkin picking at the patch, a hayride to the petting zoo and an interactive area for little ones. Admission fee covers everything but the pumpkin you take home. Kids aged two and under free. The a-maizing eight-acre maze is part of this farm’s commitment to sustainable urban agriculture, environmental education and creating wildlife habitat. The Maize Maze has been annual fundraiser for the farm since 1997. It’s a great time for the community and provides food and a temporary home for hundreds of migrating geese and cranes. The circuitous twists and turns that take explorers from one end to the other create a puzzle that unfolds in real time. Hands on activities for kids and a pumpkin patch round out the activities. There’s an after-hours maze that kicks the excitement up a notch. Open Saturdays and Sundays in October. Separate admission free for day and night attendance. If you find all of the clues in this maze you’ll make your way through with little trouble. Miss one and, well, it gets a little more difficult. The maze is part of the farm’s annual fall festival that highlights farm life with activities like cow milking, pumpkin tossing, potato pitching, water melon eating, corn shucking and, of course, riding in the wagon on a hay ride. At night, the maze turns into a haunted haunt. Open from September to the end of October. Locals know to pick up a pumpkin and a bag of the best green chiles. From the image of a St. Bernard to a tribute to the military to a shout out to the Future Farmers of America, past mazes have been asymmetrical, geometrical and convoluted. The maze, Eastern New Mexico’s largest, is eight acres of outdoor entertainment that keeps everyone guessing. There’s a ton of fun to be had if you make it out of the maze—bounce pillow, cow train, zip line, spider web, horse carousel and giant checkers will tucker everyone out. Open September through October. Admission prices vary for different activities. Family events are family traditions at this family run farm. Every October the farm hosts its annual Pumpkin Festival on Saturdays and Sundays. Activities include a corn pit for kids, hayride, duck races, tractor pulled cow and barrel train, and a distinctive corn maze that boasts a new design each year. No eating the corn along the way, though! Don’t miss the food at the Purple Cow Cafe—the green chile cheeseburgers showcase the farm-grown green chiles. Admission fee covers most activities. In this semi-arid desert area, water is at a premium so the Balzano family got creative with their maze and built it out of miles and miles of bamboo panels, a sustainable way to celebrate the spirit of the corn maze concept. The admission fee covers a host of other activities. Hayrides to the pumpkin patch, petting zoo, hay climbs, bouncy horse racing, a Nerf gun wars and fishing at the pond keeps the whole family busy. Try your hand at pumpkin slinging or pumpkin bowling and you might win a prize. View more New Mexico Corn Mazes.